Are the buildings in the picture some of the ones torn down for P&L? 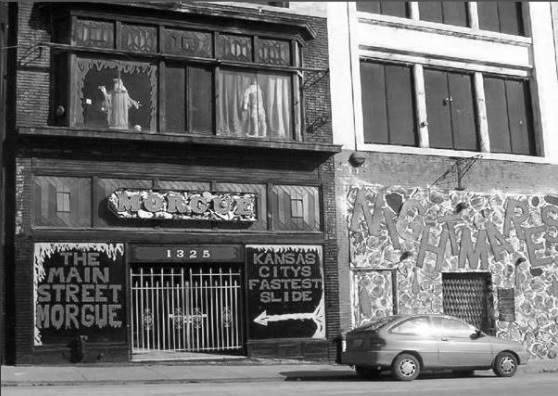 It was on one of the shorter buildings on Grand or Main (between 12th-13th) that was tore down for P&L. Main between 13th and 14th Streets, on the east side of the block. 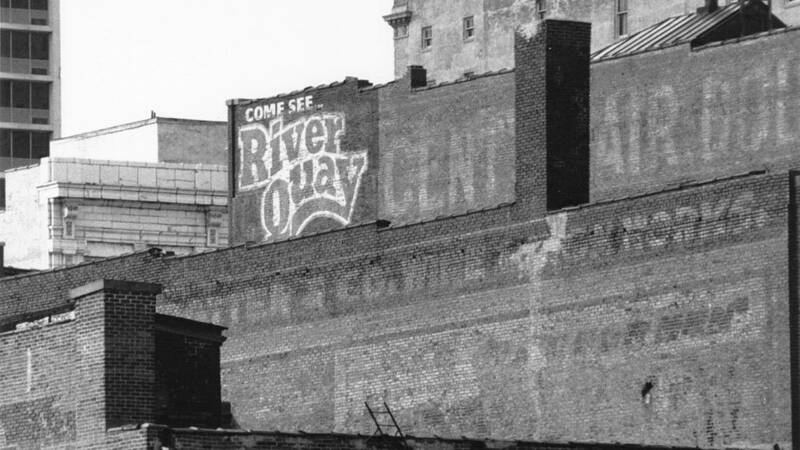 The "See the River Quay" sign was on the building that the haunted house, The Main Street Morgue, was in. This is the building from behind. Very handsome storefront before it was abused. I think Scooterj has photos from that era. As great as the P&L district is for downtown, I wish they had integrated the existing buildings a bit better. Would've injected some prebuilt character into the development. I understand tearing down some of the smaller stuff, but there was no reason the TWA building, for instance, had to be torn down. I guess we're lucky that the president and the main street theater both survived. They too were slated to get demolished at one point. Not sure why Cordish was so adverse to reusing old buildings. I made the same argument at the time. The reason was the need for big underground garages on the north blocks. The President Hotel wasn't owned by the City's Land Clearance for Redevelopment Authority. Ron Jury was already renovating the hotel by the time Cordish started demolitions, and the City had had already given incentives for it. Local activists also lobbied the City hard to save the President, and the MainStreet Theater. By the time Cordish started, the theater was owned by the City. It was part of the development deal to renovate both the MainStreet and the Midland Theater and office tower. AMC Theaters partnered with Cordish to do both, and agreed to operate the movie theater. AEG Live took over promoting the Midland. We came very close to losing the MainStreet. The then owner, Executive Hills, tried to sneak through a demolition permit before the weekend with demolition to start the next Monday morning. At the time, there were no flags on the property that would have notified council members, or anyone at the preservation office. The issuance of the permit was caught, and the media were notified in time report it. The Council acted to freeze the demolition. Equipment was sitting waiting to go when the Council stopped it. Cool, I'd forgotten about some of these! Like that Hotel President photo with all the empty light bulb boxes. Scooterj, do you have any additional photos before demolition of the Main Street Morgue building, and Nightmares, next door in that strip of buildings that included a formal attire store? It doesn't look like I have anything else. Everything I can find is from a high vantage point like in that linked thread. By the time it ever occurred to me that those buildings might be worth capturing at street level they were already being torn down. A woman posted on the Old Northeast Facebook page that Cascone's has been rented to a new tenant, who will redo the space and serve all-day breakfast, lunch, and plans to apply for a liquor license. Last edited by FangKC on Mon Feb 18, 2019 2:54 am, edited 1 time in total. As low brow diners go Cascone's has recently been at the bottom of the barrel food wise. Look forward to an upgrade even if just middle=of=pack diner but should probably offer some different items than City Diner. Like focus on potato scrambler type plates or something. Cascone's was better than Chubby's. That's really the only positive I can say about it. I love the new Local Pig/Pigwich spot. Great space. I'm assuming they butcher off-site? Last edited by brewcrew1000 on Wed Feb 06, 2019 8:58 am, edited 1 time in total. I think I read that their production kitchen is in the basement. They have the pigs skinned and halved off-site, though.